Vivian Caccuri uses sound as the vehicle to cross experiments in sensory perception with issues related to history and social justice. Through objects, installations, and performances, her pieces create situations that disorient everyday experience and, by extension, disrupt meanings and narratives seemingly as ingrained as the cognitive structure itself. 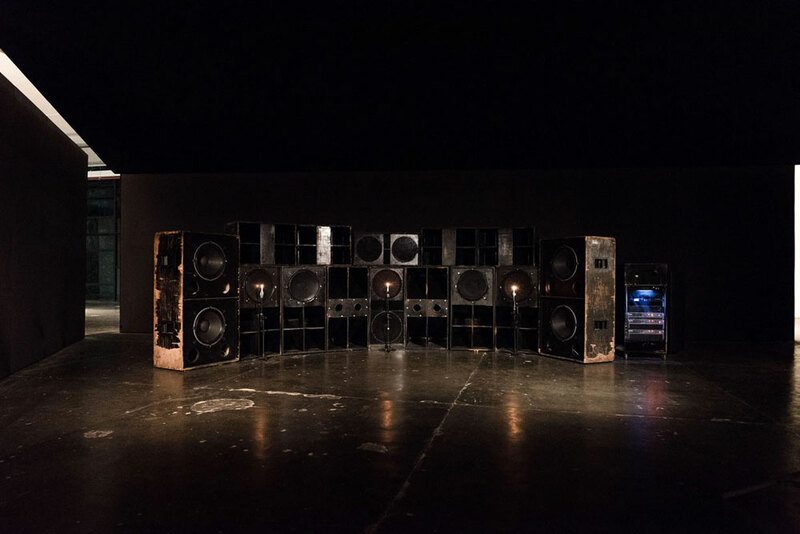 At the 32nd Bienal, the artist presents TabomBass (2016), a sound system composed of stacked speakers, similar to those used at street parties. Placed in front of them, lit candles move with the displaced air and dance to the rhythm of the deep sounds – basslines composed by artists from the city of Accra, who collaborated with Caccuri after her research in Ghana. Accra received groups of African-Brazilians after the Malê Revolt, a slave rebellion that took place in Salvador in 1835. To this day, their descendants are known as ‘Tabom’ – because, not knowing the local languages, they answered all questions with ‘tá bom’ [roughly translated as ‘okay’]. Caccuri takes this historical background, seeking to expand connections and meanings to consider the Africa-America trajectory, proposing an encounter in which Brazilian musicians and performers improvise based on the African sounds and, through this combination, create a hybrid work of art.